1. From the File menu under the vSphere client, select Deploy OVF Template (see Figure 5). Figure 5. Deploy OVF template. 2. 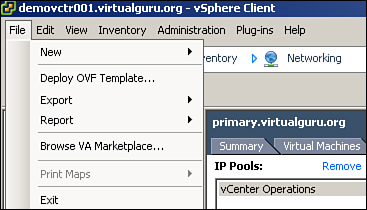 Browse to your vCenter OVF template and click Next. 3. On the OVF detail page, note that the thick disk requirement for vCenter Operations is 336 GB (for thin, it is 3.6 GB). It is recommended that the appliance is deployed thick. Click Next. 4. Accept the End User License Agreement and click Next. 5. 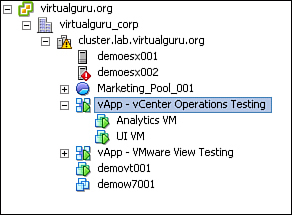 Provide the name and select the location in the vCenter environment to which you want the vApp deployed. 6. Select the deployment configuration or size of the environment. Size is defined as Small, Medium, or Large. Large is defined as more than 3000 VMs but requires 16 vCPUs and 34 GB of memory. Small is fewer than 1500 VMs but still requires 4 vCPUs and 16 GB of memory. Medium is between 1500 and 3000 VMs and requires 8 vCPUs and 25 GB of memory. If needed, you can actually throttle down the requiremetns and see how the appliance reacts, so these configurations are suggested rather than hard-coded limits. Note: Even though the resource requirements are suggested, you should not adjust the configuration of the VM below the minimum requirements to start the VM. Select the configuration that best suits your environment and click Next. 7. Select the host and cluster and click Next. 8. Select Resource Pool and click Next. 9. Select Storage and click Next. 10. Select Disk Format for the VM; recommended is Thick Provisioned Eager Zeroed. Select the format and click Next. 11. Map the vApp to a network and click Next. 12. Select Transient for the IP Policy because you have created an IP pool for this vApp. 13. Select the appropiate time zone and click Next. 14. Select Power on after Deployment and Finish to complete the deployment configuration. When the vApp is deployed, you should see a new vApp with both the Analytics and UI VM powered on (see Figure 6). Figure 6. The deployed vApp has two virtual appliances.